This post is in memory of Kathleen Bahlinger, CSJ who just shocked the community with her sudden passing while in active, great health at the age of 75. I had the pleasure of meeting Sr Kathleen during a visit to New Orleans in March for the amazing 2013 COABE National Conference. One of my life goals is to visit all seven founding communities of the Congregation of St Joseph. So when I learned I’d be heading to NOLA, I reached out to the Mirabeau congregation in Baton Rouge to find a Sister involved in adult literacy in the area. Sr Kathleen eagerly responded. The first stop on our tour was the St Vincent de Paul Adult Learning Center which Sr. Kathleen helped to found and where she continued to tutor. Like many women religious, she had a long career in education ranging from Catholic secondary teaching, Principal, math in public school, and finally the little-known but desperately needed field of adult literacy. Sr Kathleen and Sr Pat Keefe, SND in their office, a.k.a. the computer lab. Sr Kathleen gave me a tour, then put me right to work tutoring Tashanda who was studying for the GED Language Arts Test. We talked about the difference between verbs and adverbs, lay and lie. In the photo we are celebrating Regina, a recent graduate who has returned to tutor others. Students at SVdP Adult Learning Center. Parkway Bakery and Tavern in New Orleans, a local staple. Next stop was Parkway Bakery and Tavern, where I got an alligator po’boy, Barq’s root beer and Zapp’s Voodoo chips. This style of chips supposedly comes from a truck accident when all the spices got mixed up together. * I also discovered that the NOLA bishop had declared alligator as seafood for Lenten purposes, but also that the “alligator” contains pork. So I’m not really sure what I ate, but it was delicious. Lunch at Parkway Bakery: Alligator poor boy, Barq’s root beer, and Zapp’s Voodoo chips. Also seen at Parkway’s: cute Catahoula Hound puppy, the state dog of Louisiana. Next stop was a CSJ-sponsored ministry, the People Program, a very neat ministry where adults ages 50 and older sign up for a semester and can take as many courses as they want, from crafts to computers. CSJ sponsored ministry to promote lifelong learning for active older adults. This picture was taken to prove to my kids I was near real palm trees. Stained Glass Window at the People Program. Next our drive led us to Mirabeau Avenue. We stopped where the Motherhouse used to be. It was flooded during Katrina in 2005, then struck by lightning in 2006 before the sisters decided to tear down the building. 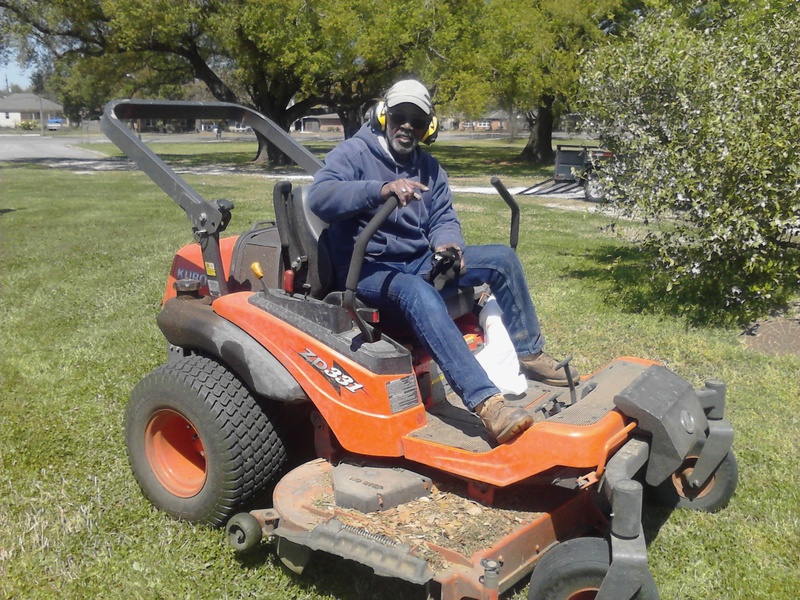 We met the groundskeeper, Thomas, who says he never works a day in his life because he loves taking care of the beautiful property. It still felt like a peaceful, prayerful place. This driveway leads to where the CSJ motherhouse used to sit on Mirabeau Avenue. Thomas the groundskeeper on his riding lawnmower. 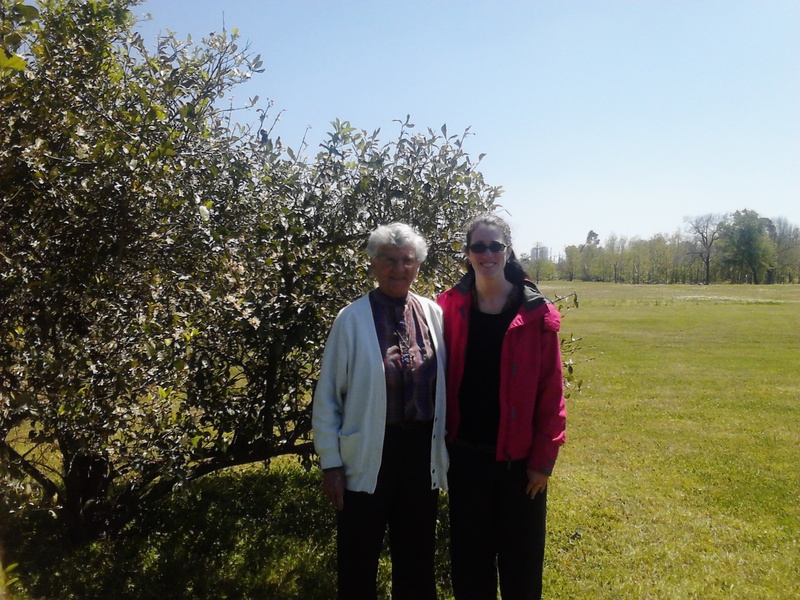 Sr Kathleen Bahlinger and I with the lemon tree next to what used to be the kitchen. It still produces lemons each year. Sr. Kathleen insisted that I couldn’t visit New Orleans without a coffee and beignet, so she treated me at Morning Call in City Park. We discussed some of the changes she’s seen in her lifetime, particularly after Vatican II. She said that the idea of obedience changed from blind obedience to a superior human to obedience to the Holy Spirit by discerning and responding to the needs in the community. For example, before Vatican II, the Sisters would all meet one day and be handed a slip of paper with their teaching appointment for the coming year, and sometimes they were assigned positions for which they did not feel equipped. In contrast, after Katrina there was a need for high school math teachers in New Orleans so Sr Kathleen asked to supply that need for a couple years, until she helped found the Adult Learning Center with Sister Lory Schaff. Coffee, beignet, and spiritual reflection in City Park. I learned a lot from Sister Kathleen Bahlinger in our day together. I learned that while levies are preventing residential flooding, they are also washing out the barrier islands, therefore making New Orleans more vulnerable to natural disasters. She reflected on the practical and emotional connections that people feel to places that must be addressed in any change management process, like the Neighboring aNew initiative currently occurring in the Congregation of Saint Joseph. Like many sister-teachers I have met, she stressed the importance of clean, comfortable facilities to maintain the dignity of clients served in low resource communities. It was a wonderful day with a sister in Christ who made a remarkable impact in her lifetime. She continues now as she lived: in the tender arms of God. *Personal integrity note: I generally dislike the use of religious symbols for unrelated marketing, especially stuff like the stereotyped “Voodoo doll” imagery which misrepresents the religion, but I ordered the chips before seeing the packaging.